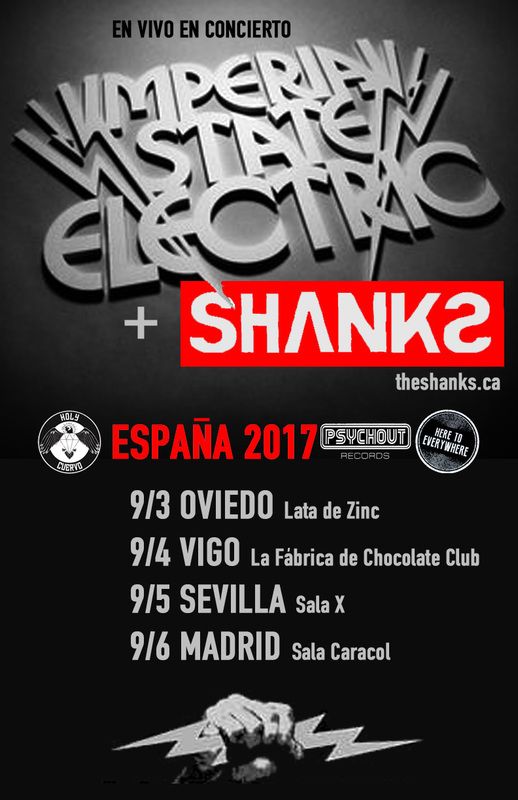 The Shanks head back to Europe to support Imperial State Electric on 4 live dates of their upcoming Spanish tour, re-joining their producer Nicke Andersson and sound engineer Ola Ersfjord while making new friends in Asturian, Galician, Andalusian lands as well as Madrid, of course. Pistolwhip von Shankenstein and Colonel Crankshaft’s Spanish adventures will be chronicled photographically for posterity, whilst we expect this to be the first of many Spanish tours for The Shanks. There’s something about The Shanks and Spain…! 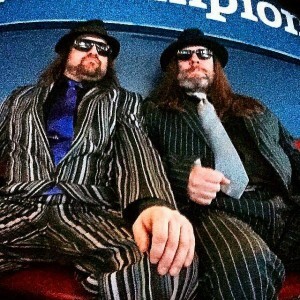 Following the release of their fifth studio album “Prisons of Ecstasy”, recorded in Sweden with Nicke Andersson and distributed via Germany’s Broken Silence distribution, Canada’s rock power duo The Shanks have been announced to assist with the mission of keeping Austin weird by playing SXSW 2017. 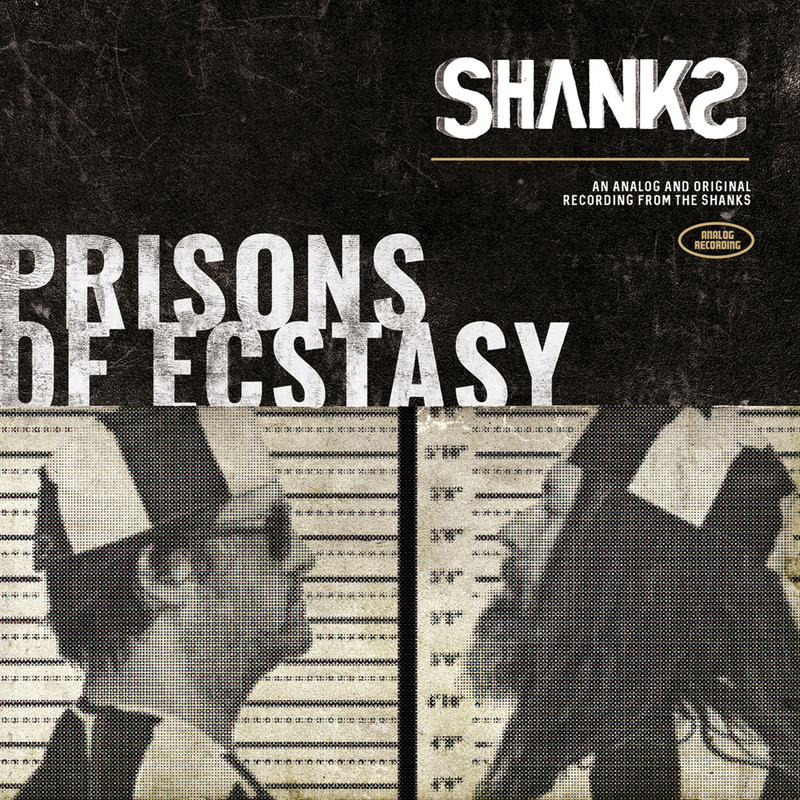 The Shanks’ “Prisons of Ecstasy” album set for October 14th release! The Shanks’ fifth studio album, “Prisons of Ecstasy”, produced by Nicke Andersson (ex-Entombed, Hellacopters, Imperial State Electric) is set for a worldwide release date of October 14th. While the US and Canada have already become familiar with the North.American version of the album, that was released Sep. 23rd, the October 14th release heralds the “Prisons of Ecstasy” DELUXE EDITION, and the CD comes with a bonus (hidden) track. The physical and digital (iTunes only) booklet also features full lyrics and the zeitgeist tales authored by Pistolwhip von Shankenstein, founder of the Shanks. Meanwhile, Colonel Crankshaft has also overseen design production for the Deluxe Edition, which was undertaken in Madrid by ZORDON Spain – another country The Shanks hope to conquer in 2017. Notes: Showcase venue TBA – Stay tuned. Ahead of the release of their brand new album, “Prisons of Ecstasy”, The Shanks return to the scene of the crime (that’s Sweden! 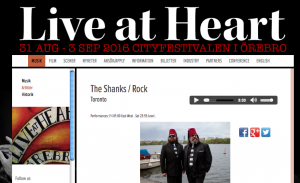 – where Nicke Andersson produced the album) to perform at the Live at Heart showcase festival: check out The Shanks’ LAH page here. Two shows will rock Orebro September 2nd at East West and September 3rd at Level. “Prisons of Ecstasy” will be released in North America September 23rd and in Europe on October 14th, and is preceeded by two singles: “Do You Fear Me?” and “Incarceration Man”. 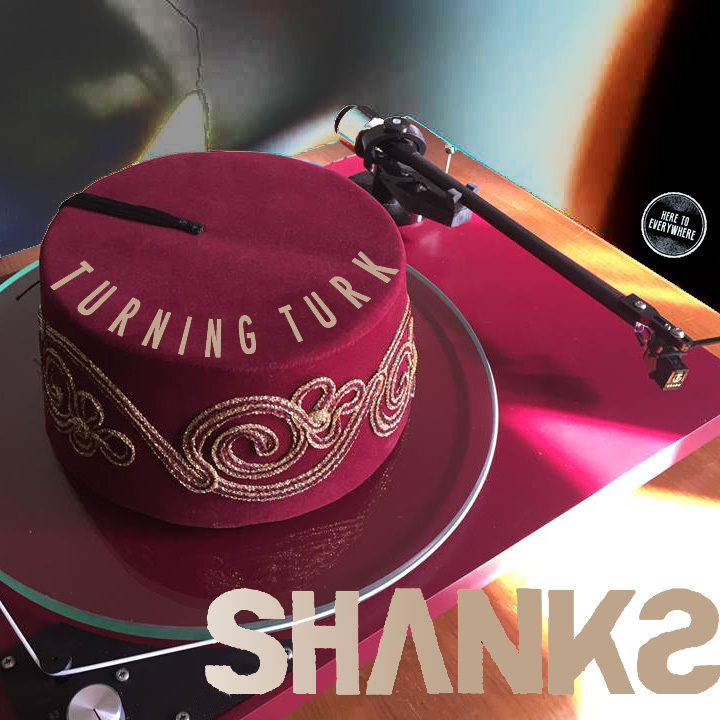 The Shanks celebrate 10 years of bass and drums rock power with a brand new EP revisiting some re-recorded, newly produced old tracks as well as a brand new tune from the ”Prisons of Ecstasy” sessions in Sweden (their next album, coming soon). Producer Darryl Neudorf produces ”Bridge of Sighs” and mixes ”English Dream”, while Sir Ian Blurton remixes ”Out of Your Mouth” and produces The Smiths’ cover of ”Bigmouth Strikes Again”, originally recorded for a sci-fi soundtrack; while The Shanks’ own Live Sound engineer, ”third Shank” Arthur Sadowski re-produces ”All My Rock and Roll Children” and Swedish superstar Nicke Andersson produces the new track ”Behind These Bars”, from the aforementioned upcoming album ”Prisons of Ecstasy”… all in all a Shanktastic rock n roll celebration of 10 years of bass and drums from Canada’s THE SHANKS. OUT OCTOBER 16th at all fine digital retailers! The Shanks unveil “Prisons of Ecstasy” Teaser! Founded on a farm in Mono, Ontario, Canada, in 2005 by Ian Starkey, aka St. Pistolwhip von Shankenstein XVIII, The Shanks are a blistering rock duo comprised of bass and drums, with Jody Brumell aka Colonel Crankshaft rounding out the line-up. To commemorate The Shanks’ 10th anniversary, The Shanks are teaming up with Nicke Andersson (Imperial State Electric, ex-Hellacopters/Entombed, multi-instrumentalist and record producer) in Sweden to record what will be The Shanks’ fifth full-length studio album, working title “Prisons of Ecstasy”, engineered by Ola Elsfjord. During this past month of May, bedtracks were recorded on tape at Stockholm’s Studio Gröndahl, with overdubs and mixing now underway at Nicke Andersson’s own studio. A mini-film teaser is now available as a sneak-peak into the recording shot and directed by Mattolavold Stockholm! A combination of 1970s album-oriented rock and proto-punk with their very own unique zeitgeist, The Shanks belt out melodic chordal arrangements amidst a sea of low end and pounding rhythms. It’s haunting, tribal arena-rock played on a basement floor, hailed by Germany’s Rolling Stone magazine for both their songs and attitude on their last album, “Surfing the Lexicon”, produced in Canada by Sir Ian Blurton and released via Phratry Records in the US. To commemorate The Shanks’ 10th anniversary, The Shanks are teaming up with Nicke Andersson (Imperial State Electric, ex-Hellacopters/Entombed, multi-instrumentalist and record producer) in Sweden to record what will be The Shanks’ fifth full-length studio album, working title “Prisons of Ecstasy”. During this month of May, bedtracks will be recorded on tape at Stockholm’s Studio Gröndahl, with overdubs and mixing at Nicke Andersson’s own studio. The Shanks’ European management will then begin the process of shopping the album to European labels. The Shanks’ German Heavy Metal Girl tour! The Shanks play Reeperbahn Festival 2014! The Shanks have been confirmed to perform at this year’s Reeperbahn Festival, at the venue Pooca Bar, for the AMAEI showcase in Hamburg. 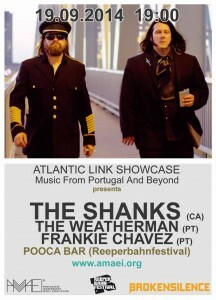 The AMAEI is the Portuguese Independent Music Association, and for their “Atlantic Link Showcase” AMAEI have invited The Shanks to perform as their international guest, alongside The Weatherman and Frankie Chavez.